Early Thursday morning, five dolphins were seen stranded on the beach in Provincetown, Massachusetts. Officials responded immediately, rushing to the beach to care for the animals and transport them back to the ocean. Though one of the dolphins died, the other four are doing fine and were just released back into the ocean, reports the Cape Cod Times. "So far the animals look good," said Brian Sharp, stranding coordinator for the International Fund for Animal Welfare, which examined the dolphins before release. "One is a little skinny." This isn't the first time the area has seen dolphin strandings. 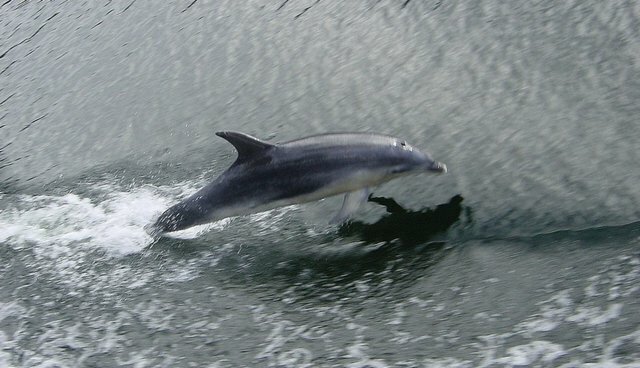 In 2009, four common dolphins were rescued in the same area. It's difficult to say exactly why the dolphins stranded -- according to Discovery News, strandings like these can be attributed to many different causes, including unusual weather, chasing prey, disease and underwater noise from sonar or shipping.